For the last 28 years, Dr. Celeste Hart has practiced endocrinology in the building where in 1957 her father, Dr. Alexander D. Brickler, joined her grandfather, Dr. Russell L. Anderson, in a primary care practice. In fact, she was born across the street at Florida A&M University Hospital, she said. The Anderson Brickler Gallery — named after the two renowned physicians — is on the first floor of the building. The gallery is a second job and labor of love for Hart, who began collecting art in college when she won an online auction of a painting by Romare Bearden. When the practice had nine providers, the first floor served as their lunchroom and offices, Hart said. She removed doors and redid the flooring to create the gallery space below her practice. Upon entering the gallery, visitors encounter information about the featured artist before following a circular path through a series of rooms hung with their work. 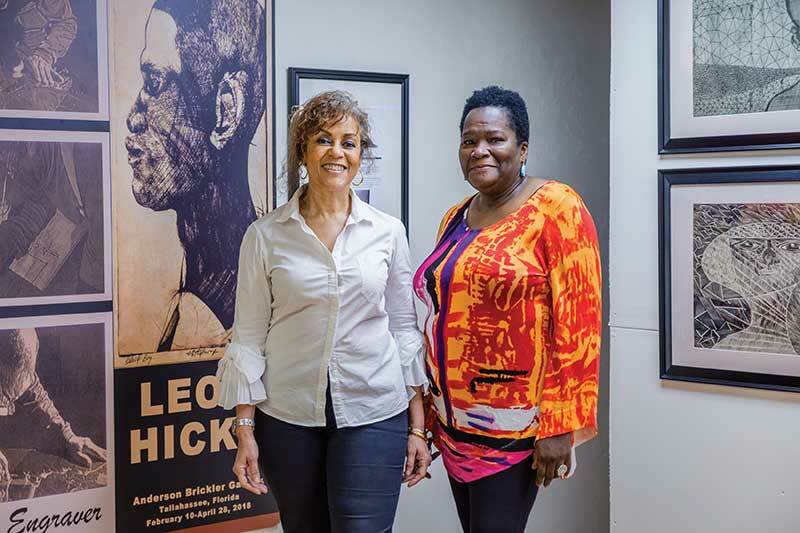 “The gallery is an educational experience where you can learn about the artist and their place in history and an excellent resource for research,” said Kabuya Pamela Bowens-Saffo, Anderson Brickler Gallery’s chief curator. The painting Hart bought, Bearden’s “Circe Turns the Companion of Odysseus into a Swine,” hung on the wall for the gallery’s first show, which opened in October 2017. Bearden’s paintings are represented in public collections at the Metropolitan Museum of Art, the Museum of Modern Art, the Philadelphia Museum of Art and many other places. The gallery features fine art editions and works on paper by modern, post-war and contemporary artists with a focus on African diasporan artists. “Here, the artist’s works explore visual aesthetics of beauty. Also meaningful are the artist’s approach and skills in the creative process. These insights are relevant to American and African-American history,” Bowens-Saffo explained. In October, the Bearden exhibit opened with a lecture from visiting guest scholar Deirdra Harris Kelly from the Romare Bearden Foundation in New York. A second show, of Leon Hicks’ engravings, launched in February with a talk by the artist and an unveiling of limited edition prints. In May, Anderson Brickler Gallery will serve as one of three sites exhibiting student work on the theme of “Waging Peace,” along with Florida State University Museum of Fine Arts and The Council on Culture and Arts (COCA) exhibiting at City Hall. As part of this exhibit, the gallery plans to install in its outdoor space a large-scale cultural piece inspired by Bearden. Other upcoming exhibits include printmaking and mixed media work by contemporary artist Ken Falana, and pieces by the modernist painter Beauford Delaney, for which the gallery hopes to invite scholars of the writer James Baldwin, a close friend of Delaney, fellow expatriate, and subject of many of his paintings. In addition to producing exhibits and arranging scholarly talks, the gallery hosts an artists-in-residence program and supports university students and professional artists in “Art in Public Places” projects. With so much underway, it can be hard to remember that Anderson Brickler Gallery is relatively young. It was only in February 2017 that Hart and Bowens-Saffo met at Bowens’ solo show at LeMoyne Center for the Visual Arts; eight months later, Hart opened the gallery. She credits Bowens-Saffo with helping her bring the project together, along with support from a friend who runs a gallery in New York. To talk with Hart and Bowens-Saffo is to share in their feeling of gratitude and love for the work Anderson Brickler Gallery showcases. At the time of our interview, Bowens-Saffo was planning visits for classes of students at Florida A&M University and Rickards High School.